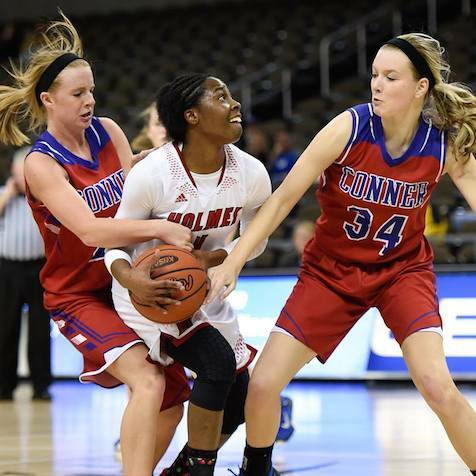 The aggressive, in-your-face defense that’s become a staple of the Holmes girls’ basketball team was highly effective in the semifinals of the 9th Region tournament on Saturday at BB&T Arena. The Bulldogs allowed only one point in the first quarter to take an early lead and went on to defeat Conner, 64-32, to earn a spot in the regional final for the second consecutive year. Holmes (27-4) will play Ryle (24-6) in the championship game at 6 p.m. Sunday with the winner advancing to next week’s St. Elizabeth Healthcare/KHSAA “Sweet 16” state tournament that will also be played at BB&T Arena. The Bulldogs have now held 14 opponents to 40 points or less this season, but it was a little surprising to see them do it against a Conner team that had won 22 games and was ranked among the top 10 in the Northern Kentucky coaches poll. Conner wasn’t able to make a field goal until the 5:15 mark in the second quarter and ended up shooting 23 percent (9 of 39) from the field with 16 turnovers against the Bulldogs’ defense. The 32-point final margin made it the worst loss of the season for the Cougars and nearly doubled the team’s 17-point loss to Holmes during the regular season. After taking an 18-1 lead in the first quarter, the Bulldogs didn’t let up. They were ahead 39-12 at halftime and 59-21 going into the fourth quarter. They ended up shooting 62 percent (18 of 29) from the field with a 28-14 rebounding advantage. Holmes senior guard Jynea Harris scored a game-high 23 points. Sophomore forward Tyrah Engelmon posted a double-double with 15 points and 13 rebounds. Holmes has not lost to a Northern Kentucky opponent this season, but one of its closest games was a 41-37 win over Ryle on Dec. 11. The Bulldogs had a hard time dealing with Ryle’s size advantage in that game. HOLMES (27-4): Harris 9 4 23, Graham 3 0 8, Englemon 3 8 15, Stovall 1 8 10, Brown 1 2 4, Johnson 1 2 4. Totals: 18 24 64. CONNER (22-12): Hurst 2 0 6, Kennedy 0 1 1, Hendricks 1 0 2, Gambrel 1 5 8, Duncan 0 3 3, Boelter 2 0 5, Jordan 1 1 3, Mclemore 1 0 2, Frye 1 0 2. Totals: 9 10 32.